Urban Visions: Art as Social Practice? Urban Visions is a group gallery show of USC affiliated artists who re-narrate and elucidate the contemporary city. The exhibition features four media projects that question accepted forms of representation through critical cartography and new modes of mapping; community storytelling; and immersive journalism. Taken together, the projects invite participants to actively engage in media experiences in order to consider how communities shape a sense of place and cultural identity, as well as how local ethnic communities help us reconfigure our understanding of transnational identity. The exhibition is co-curated by Professor Holly Willis, Chair of the School of Cinematic Art’s Media Arts + Practice Division. This exhibition is made possible by the generous support of USC’s Visions and Voices program. François Bar, Associate Professor in the Annenberg School for Communication and Journalism, will present an installation of his Healthy Food South LA map project with collaborators Community Services Unlimited and Trust South LA. This work is part of a series of maps which has also been shown at the Guggenheim Museum and illustrates the potential for collaborative mapping to help participants re-narrate their neighborhoods. Kristy H.A. 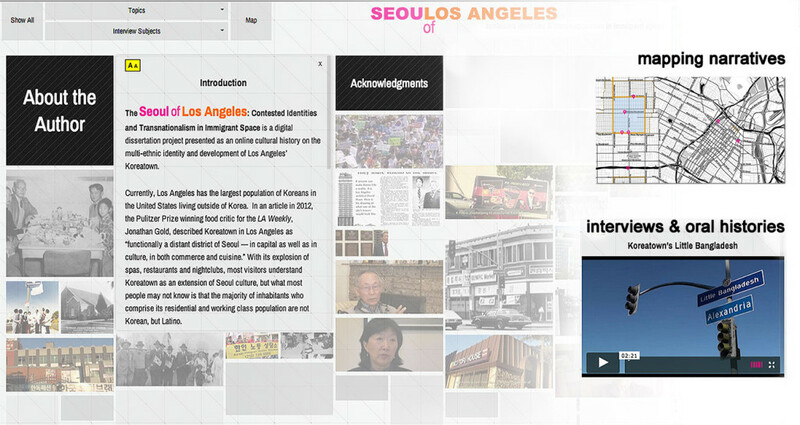 Kang, will present Seoul of Los Angeles, an interactive website that explores the cultural history of Koreatown and the Bangladeshi and Latino communities that also reside in the neighborhood. Dr. Kang earned her PhD in Media Arts + Practice in SCA, is Associate Director of SLAB, and is an Assistant Professor at the School of Art, Design and Media at Nanyang Technological University, Singapore. Nonny de la Peña, a Media Arts+ Practice doctoral candidate, has been pioneering the new field of immersive journalism. She will present Hunger in LA, a virtual reality project that immerses viewers in a dramatic experience while standing in line at a Food Bank in downtown Los Angeles. 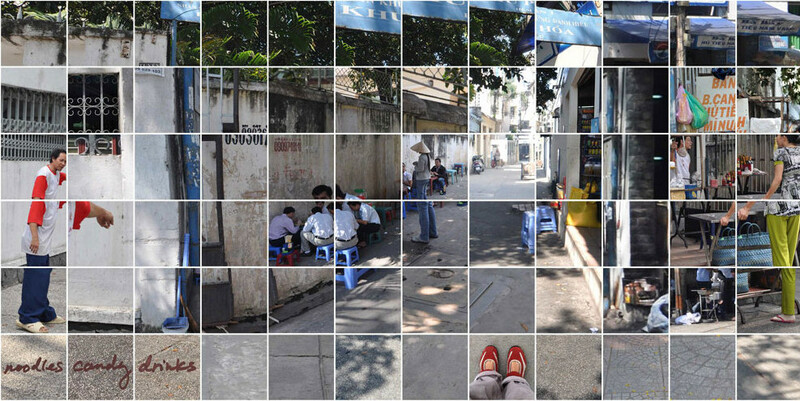 Annette M Kim, an Associate Professor at the Price School of Public Policy, will present an immersive digital installation that illustrates how sidewalk space was re-negotiated in a neighborhood over a 10-year period; this artwork became a national discussion piece as the city considers the role of migrant street vendors in the city.